Steven Zevitas Gallery is pleased to present juddpaintings, an exhibition of new work by New York-based artist Franklin Evans. The exhibition will be on view from Friday 24 October through Saturday 13 December, 2014, with an opening reception Friday 7 November. 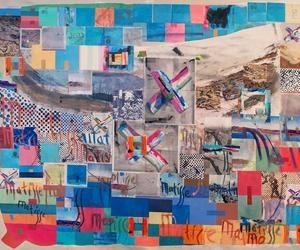 In juddpaintings, Evans presents a new installation comprised of wall painting, collage, paintings, digital prints, tape, process notes, and laminations. The exhibition presents the decomposition of his installation practice to the primary object subject of his practice: Painting. Upon entering the exhibition, the viewer passes through a threshold of a floor to ceiling installation of paint, images and process and into a gallery of walls painted bands of the color spectrum that dissolves to white. Paintings are hung on the walls and move from varying degrees of contextual mediation to an uninterrupted object on a white wall. Juddpaintings alludes to Evans’ concurrent installation at Montserrat College of Art in Beverly, MA titled juddrules. For both projects, he uses parts of specific art reviews by Donald Judd to derive “rules” to inject into his environments and paintings. For example, a 1962 review of Morris Louis at Emmerich Gallery is pared down to, “… six equal bands. The yellow medium, yellow deep and red light bands make a progressive group, but the same red light, a green, a brown and another red light make a symmetrical group.” Two paintings use this rule as starting points and as limitations that the color relationships establish in the repeated depiction of images. Evans’ repetition of images parallels the density of images experienced in contemporary culture. He embraces the unstable ground of fluid refocus, obsession, and repurpose. In juddpaintings Evans’ hand rearranges and repurposes: donald judd, 1959, morris louis, 1962, friedl dzubas, josef albers, roberta smith, henri matisse, san francisco, sigmar polke, manhunt, ox-bow, montserrat, ellen alfest, mel bochner, sarah charlesworth, jay defao,	pyramid lake, davos, gerhard richter, lewis baltz, romanian blouse, 1975, bathers, david jacobs, paintingassupermodel, juddrules, lemon valley, 1967, stead, nevada, 1977, beverly, boston, martial raysse, trompe l’oeil. Franklin Evans was born in 1967 in Reno, Nevada and lives and works in New York, NY. He has degrees from Stanford University, the University of Iowa, and Columbia University. Since 2005, Evans has had fifteen solo exhibitions in the United States and Europe and numerous group exhibitions at venues that include, among others: MoMA PS1, New York, NY; Nevada Museum of Art, Reno, NV; deCordova Sculpture Park and Museum, Lincoln, MA; DiverseWorks, Houston, TX; RISD Museum, Providence, RI; Weatherspoon Art Museum, Greensboro, NC; Futura, Prague, Czech Republic; El Museo del Barrio, New York, NY; The Drawing Center, New York, NY; Yerba Buena Center for the Arts, San Francisco, CA; Federico Luger, Milan, Italy; Ameringer McEnery Yohe, New York, NY; Sue Scott, New	York, NY. His current installation juddrules at Montserrat College of Art, Beverly, MA runs through December 14. Evans work is included in the public collections of Orlando Museum of Art, Orlando, FL; El Museo del Barrio, New York, NY; Weatherspoon Art Museum, Greensboro, NC; Sweeney Art Gallery, University of California, Riverside, CA; Pizzuti Collection, Columbus, OH; The Progressive Art Collection, Cleveland, OH; Salomon Foundation, Annecy, France. The artist will be present for an opening reception on Friday, November 7th from 5:30 – 8:00 PM. For additional information, please contact Steven Zevitas	at 617.778.5265 (ext. 22). Gallery hours are Tuesday through Saturday, 11AM – 5 PM.